And this message applies to our whole country. We don’t know what to do. The last time I was in a “nuclear attack drill” as a civilian was in the early 70’s when I was in grade school in Ohio. We called these “tornado drills” but I always suspected they were thinly veiled “duck and cover” drills. Yes, there are tornadoes in Ohio so perhaps I’ve never actually been in a nuclear attack drill as a civilian at all. As an adult, I have owned houses in three states. Not once has anybody ever rang my bell to talk about emergency preparedness. I think in my adult life I might once have received an emergency preparedness pamphlet in the mail. Obviously because of my military and emergency response experience, I have a leg-up in terms of knowledge, but I am not most people. FEMA Administrator Brock Long told Congress on November 30, 2017 that “we do not have a true culture of preparedness in this country.” So let me ask you a question: Do your people know what to do? Definition: the term “your people” means the people in your community. The civilians. If this message comes over everybody’s cell phones right now, do your people know what to do? Are they prepared? And by the way, for those of you who are thinking “well we’re way up here in Northern ___ and there isn’t a target for hundreds of miles” do you think that nothing will happen to you? Likely you will lose power for months (or longer) and not see any food or fuel deliveries for months (or longer). Your community will possibly find itself host to hundreds or thousands of desperate, sick and starving refugees. Are you prepared for that? What if I told you that there is very little cost to starting a civil defense organization in your town? That it would not “cost” resources but multiply your resources? There are no downsides to preparing your community. What we should take from the Hawaii false missile alert? It is unacceptable that in the U.S. we have an emergency alert and “nobody knew what to do.” We must fix this. 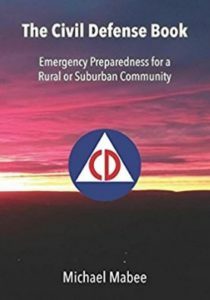 Building a culture of preparedness – a civil defense culture – is a critical task for the national security of the country.